Have you ever been hungry and decided to pop a piece of gum in your mouth? But wouldn’t that just make you hungrier? Chewing gum stimulates the gastric juices, meaning there is more saliva. You then swallow the saliva and your stomach thinks there is food coming down. When no food comes down, you become hungry. It is like chewing food but spitting it out. 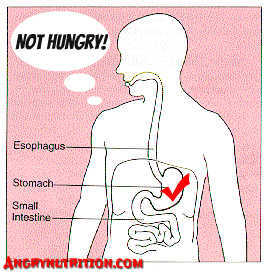 The body thinks it is getting food and nutrients but ends up getting nothing. To test this, one experiment was done that made contributors chew gum before every meal and track their food in a food diary. The results were that the ones who chewed gum before eating their meals ate less, but the meals they consumed had a lot more calories and a lot less nutritious foods. Another study took a completely different route. This University of Rhode Island study showed people who chew gum eat 68 fewer calories at their lunch, while avoiding sugary foods. Louisiana State University says chewing gum can help control appetite, decreasing their normal calorie amount by 40 calories. 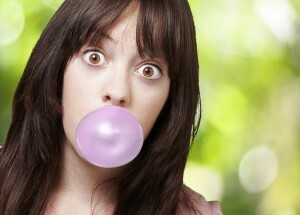 One more article showed that chewing gum does not lessen amount of food ingested or hunger. They said although they technically ate less meals, they just ate more at those meals. They also said people who chew gum eat more junk food because the minty taste makes healthy foods taste bad, similar to brushing your teeth then drinking orange juice. Almost every study about chewing gum is different. For example, “Appetite” in May 2007 studied that chewing gum 15 minutes per hour after lunch made people want salty snacks not sweet ones. Then, in October 2011, “Appetite” did another study with chewing gum 15 minutes per hour after lunch and found that those people ate 10% less in general for their snack three hours later. There really is no right answer to this problem. Personally, I would think it would make one hungrier because they are chewing and not swallowing anything. Maybe some better studies could be done. They could feed people of the same health, diet, and age the same exact meals and then give half of them gum to chew and half of them not. This would be a controlled double-blind trial, making it able to be more accurate. After a month of doing this, one could check what the control groups ate after they chewed the gum later in the day. They would be given a plate of food each night and told to eat as much as they were hungry for. Then, scientists could check the results and see how chewing gum really affects one’s appetite. This entry was posted in Uncategorized on December 2, 2015 by Caitlin Whelan. Caitlin- I found your blog post about weather or not chewing gum makes you hungry very relatable! Being an avid gum chewer myself, I’ve always wondered if constantly having a piece of gum in my mouth was affecting my eating habits for the worse. It’s unfortunate that scientists are still unaware of the effects that chewing gum has on one’s appetite! I feel like both sides of the spectrum could be easily argued for. For instance, you’d never decide to snack on a bag of chips or popcorn with a fresh piece of mint gum already in your mouth. One would either spit out the gum and choose to consume the calories, or simply steer clear of the food. On the other hand, I see how gum could potentially spark one’s appetite: If you’re chewing on a piece of flavorful gum but never actually digesting any food, it’s understandable that your body may begin to crave a snack or meal. While it may be unclear as to weather chewing gum provokes the body to eat more or less, there’s been scientific evidence that proves there is no correlation between chewing gum and weight loss. Information on this topic can be found in this article here. I really liked this blog overall. From the beginning I agreed with you, I would think chewing gum is like tricking your body into thinking you are eating something that you will never swallow. With more saliva being produced, there is not doubt that our bodies should think that there is food that will soon be entering the body. I found it particularly interesting that all of these studies did not point in one similar direction. I would have thought they would have all had very similar data. I like how at the end you presented your own study, which I think could be a very affective one to find an answer to the hypothesis. The studies I found pointed in the direction of one of the ones you found. They say that chewing gum can lead to obesity, as it increases the intake of junk food. The study was designed so that half the participants would play a game to win fruit, and the other half would play a game to win chips and M&M’s, and while they did this they would be chewing on either Juicy Fruit or Spearmint gum. This study found that those who were chewing the mint gum did not play the gum for a long time if they were only being given fruit as a reward. This leads me to think that it may be important to consider whether different gums have different affects on the body. If scientists can find the mechanism by which gum affects hunger, they can find which gums share this mechanism and which don’t. This is a well written and very interesting blog. I think the experiment you made up should be performed one day. It would give us a more clear answer as to if chewing gum makes you more hungry. It is weird to think that chewing gum can actually make you more hungry because before today I would always chew it to try and stop my hunger. If your experiment is ever performed, the contestants should eat the same exact meals, but in between each meal one of the groups will chew gum and the other group will be the controlled group. If the group that chew’s gum in between each meal snacks more, than clearly chewing gum will make someone more hungry. There are a lot of other foods that actually make people hungrier. Here is a link to a couple of the foods that make people more hungry after eating them. Ever since high school I have been wrestling. People always ask me why I chew so much gum the day before a tournament/match. The reason for it is because it helps lose weight. This is possible because chewing causes saliva to build up in the mouth, which wrestlers usually spit out in order to get rid of “water weight”. Also, studies show that moving the jaw muscles helps burn calories (as would moving any other muscle). After some research I found that chewing gum can burn up to 11 calories an hour on its own. Follow this link to find out more ways that chewing gum can help regulate one’s eating. This is a good, well researched post. The studies you found showed that this issue is quite complicated and does show that it requires a more complex and controlled experiment like you suggested. It would also be interesting to find out why chewing gum seems to cause people to eat less healthily. It also makes me wonder if this issue suffers from the file drawer problem. None of the studies you found came to the conclusion that gum did not effect eating habits. This conclusion may have been too boring and thus may not have been published. Gum is like my best friend I never go anywhere without it! I personally do believe that chewing gum with suppress hunger at least for a little while. I think the 3 different studies that you looked at are all very interesting but i think the information from them would of been a lot more valuable if they controlled more variables and then we knew that the gum chewing was the only thing causing people to eat less. I found a really good study http://www.wrigley.com/global/documents/appetite_study_2007.pdf that shows a more controlled experiment of people chewing gum before every snack and meal and it was consecutive with your results and showed that gum chewing tended to make people eat less than not chewing gum. I now wonder, do different flavors of gum contribute to this finding?